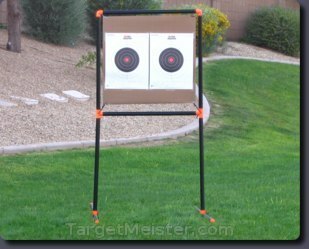 The original portable target stand by Target Meister. This is the target stand component of the original target system. You're able to shoot up to two target stand poles and still stay in business. How you ask? Well, just replace the damaged pole with one from the base. The stand will be slightly less stable, but hey, you're still shooting and that's all that matters. Just remember to head back to TargetMeister.com and order some replacement parts. Frustrated with Your Ineffective Homemade Target Stand? Your days of dumpster diving or saving cardboard boxes and other rubbish to shoot at are over. If you've ever been frustrated with that, you have probably wasted an afternoon or two attempting to build some monstrosity of a stand that requires a dedicated team of personnel to transport. Do yourself a favor, just get a Target Meister target system. Our target systems are no brainers, so you'll save yourself a headache. Time? Yeah, you'll be saving lots of it. That means more time for you to perfect your aim. Money? Well, what's your time worth? You know you will waste a bunch of time and gas heading over to the local hardware store. At that point, you'll walk out of there with a bill that's looking comparable to the price of our target system. However, you still have several hours to punch in on the clock and dream up something with whatever it is that you bought. By the time you're done, you'll be over budget, over worked, have less shooting time, and wonder where the hell you're going to store the beast. You know your better half will nag you about that eye sore every time they walk into the garage. Bottom line: you'll be burdened with an inferior contraption that you're almost too embarrassed to take to the range.